Katie Steelman and Abbie Boatwright invested brains and heart in their shop, OKO. Despite growing up in downtown Rome, an epicenter of international fashion, the Steelman sisters never thought they’d land in the industry. Though they snuck out after every Sunday church service to the neighboring Louis Vuitton store, scoping out the latest fashions to hit the racks was nothing more than a hobby. Still, living “La Dolce Vita” among the influences of Valentino and Versace are what solidified the siblings’ timeless, chic style. Fast forward to early adulthood after the Steelman family had relocated to the states. Katie just graduated from the University of Southern Mississippi and, in Florida, older sister Abbie married, became Abbie Boatwright and had two babies. Though the sisters had always discussed starting a business together, the time was ripe to create a plan and set it in motion. One of those led to the Dominican Republic, where their father’s nonprofit, Global Effect, issues microloans to impoverished communities in hopes of boosting job creation. When he told his daughters about a group of Dominican women skilled in sewing and seeking employment, clothing just seemed like a natural fit. 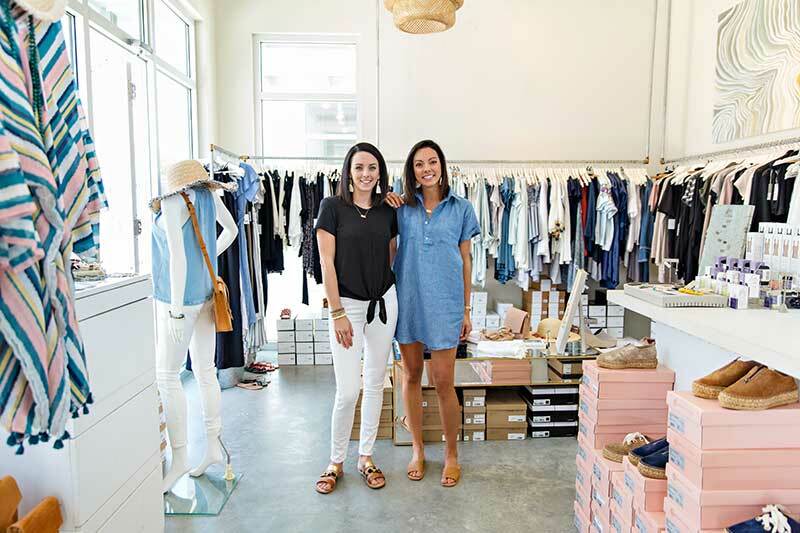 OKO opened its doors in the spring of 2016, occupying a petite nook of The Hub 30A with both franchised designers and their own private label. A seven-week whirlwind later, OKO Kids debuted right next door — which was never part of the immediate plan. “We dreamed that one day we would make a kid’s line, and even mentioned to our landlord that it was something we wanted to do down the road … but I’m talking way, WAY down the road!” Steelman laughs. “To his face, we were like … psh, yeah … of course!” Steelman said. “Internally, we’re freaking out, but we couldn’t pass it up. The girls’ mom always scolds them for “flying by the seat of their pants,” but they insist they work best under pressure. Within the first few years of opening, an all-new OKO men’s line was flaunted at an American Music Awards gifting suite in Los Angeles. A third store will soon debut in Rosemary Beach, and the pair launched their very first swimwear line this summer. Clearly, they’re right. Anything you see with an OKO label is designed by Katie and Abbie, then hand cut and sewn in the Dominican Republic. They know beach bums here don’t like to get too dressed up unless they must, so they like to keep it casual, utilizing high-quality materials in neutral tones. Boatwright brings over a few of their favorite “Luxury Basics,” including their classic, Victoria V-neck top in black. Breezy and easy, it would look great with a half-tuck into your favorite jeans, or let loose with a chunky necklace to dress it up. The bamboo Bella T-shirt Dress is another versatile piece, leisurely enough to throw over your swimsuit with a panama hat, or capable of embellishment with a belt and heels for a night out. Their hope is that if you have 10-15 OKO pieces in your closet, you’ll be able to mix and match them for any occasion. Boatwright says her goal is to look at photos of herself 20 years from now and not be embarrassed about what she’s wearing. Though the two finish each other’s sentences and possess a striking, similar beauty, their everyday styles differ. Abbie tends to be a bit more adventurous, with pops of vogue statement pieces, while Katie exudes effortless, chic modernity. 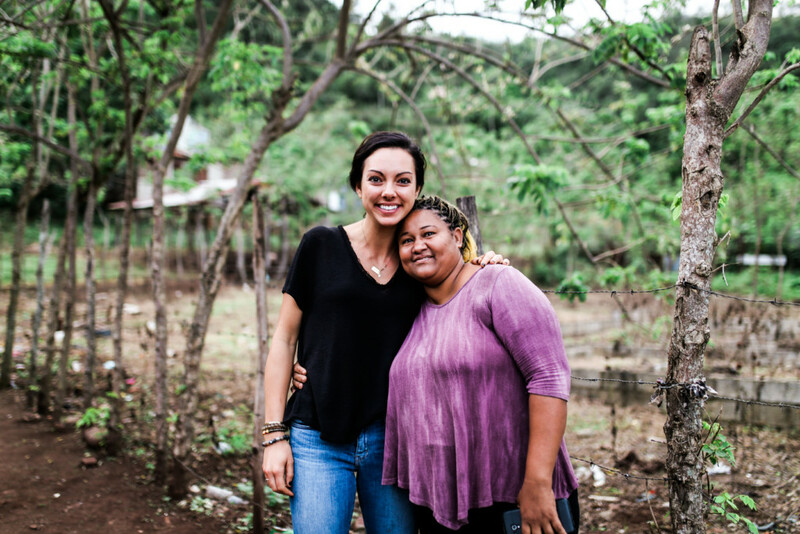 But both are enamored with OKO and improving the lives of others, making as many as four trips to the Dominican Republic a year to work alongside their employees. “There’s the sweetest woman named Rosie, and we like to call her our manager because she oversees the workshop when we’re not there,” Steelman smiles. In the next few years, the sisters hope to employ 100 impoverished women with their label. The letters in their brand name, OKO, represent overcoming hardship, kindness in action and creating opportunity. It’s not just a label for the sisters. It’s a commitment. We should all try it on for size.